Mathematically perfected economy™ is a currency not subject to interest, comprising a principal debt financing all permissible enterprise, paid by each and every debtor exactly as they consume of the associated production. There is no inflation or deflation, as the currency in circulation is always equal to the current value of existent production, respectively equal to any increase in circulation across however much of the economy is supported by that circulation. 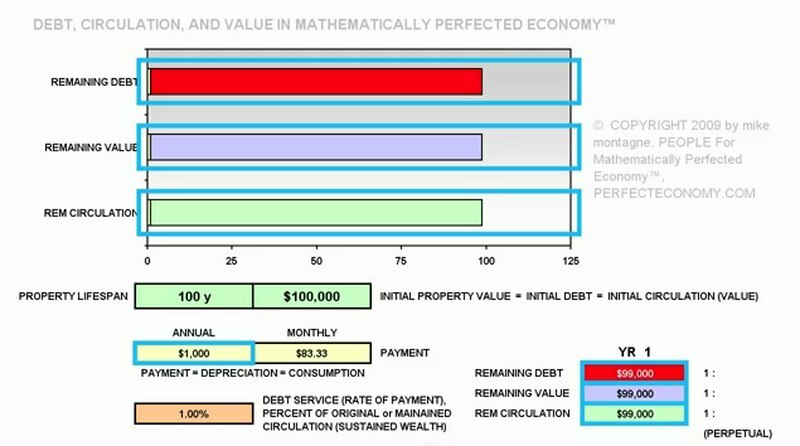 Neither the value of money or assets are altered by changing proportions of circulation to indebted assets or services. The value of the money is always consistent in quantity — both in earn-ability and spend-ability — with the remaining value of the indebted assets which exist, for which it was issued, and which constitute its immutable value. The remaining circulation is always sufficient to pay off debt. Further production therefore is not impeded by a deficient circulation, diminished by paying more than what circulation was introduced for to finance the production. Principal Debt is not multiplied beyond the circulation or remaining value of indebted assets. To pay debt obligations exceeding the remaining value of indebted assets sets off a perpetual cycle of re-borrowing and multiplication of debt. Merely to maintain a circulation, we must borrow again so much as we have paid beyond the original circulation which was equal only to the un-multiplied debt. Mathematically perfected economy™ is no more than a singular prescription, dissolving unjust intervention.